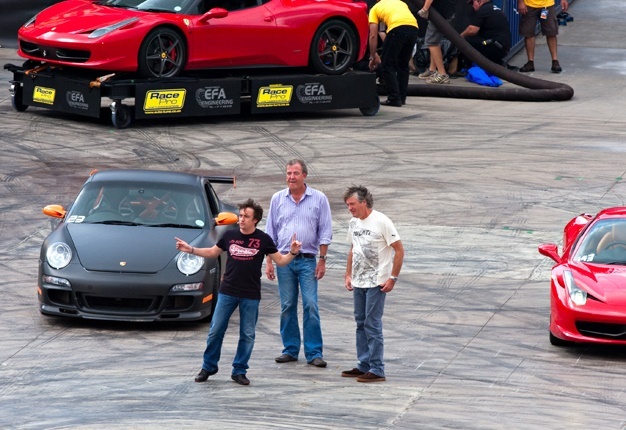 The Grand Tour was one of the most anticipated series of last year as it reunited the former Top Gear stars – Jeremy Clarkson, Richard Hammond and James May – who left their flagship show after their contract with the BBC wasn’t renewed. The trio, or the ‘Holy Trinity’ as their first episode is titled, bring their own brand of wit and knowledge to their new series and entrap us in a world of humour, fast cars, and the right kind of torque. 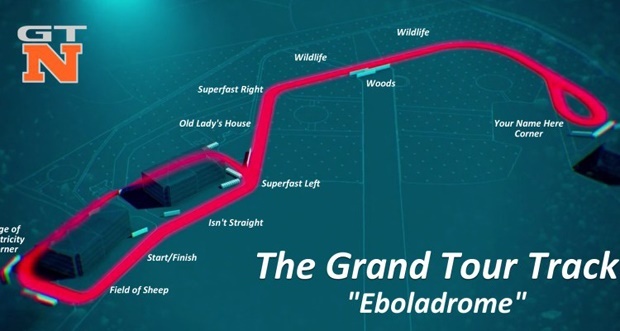 The unfortunately-named “Eboladrome”, because, according to Clarkson, the track resembles the shape of the Ebola virus, has been used on the show in order to test each of the vehicle. All cars were driven by NASCAR driver, Mike Skinner, so that they all have the same driver on the same track in order to gauge the speed. The first lap that took place was in a 2016 BMW M2 which recorded a time of 1:26.2. 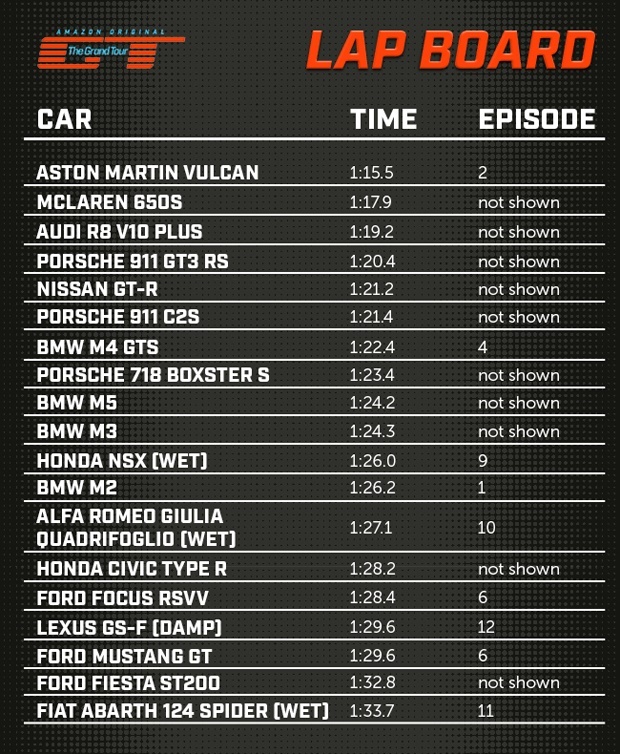 With the Grand Tour grand finale having aired on 3 February 2017, we take a look at the lap board’s final line-up. Of course, like any petrolhead, we have our favourite cars that have been featured on the lapboard, and here are our reasons we love these speed machines. A popular sports car, the McLaren 650S will leave your peers in the dust, and is the fastest car on The Grand Tour lapboard. The 650S has a carbon-fibre-reinforced polymer chassis and a McLaren M838T 3.8-litre V8, twin-turbo engine. The power is transmitted through a seven-speed dual-clutch gearbox. The Audi R8 is a popular choice when choosing a sports car – it is the one that many people mention in their fantasy, and the one that speeds up the hearts of all who come into contact with it. It boasts Audi’s trademark Quattro permanent all-wheel-drive system and is built using space frame principles. This is the first production car with full-LED headlamps. This sports car has a number of variations which are designed for road and track duty. It is also known for being a racing car as it has won many championships and endurance races. The GT3 RS is now equipped with front fenders with louvres above the wheels. It also has a 4.0-litre unit with 500 horsepower (368kW). The car enthusiasts’ vehicle of choice, the Nissan GT-R has a 3.8 litre VR38DETT twin-turbo V6 engine, and a 6-speed sequential dual-clutch transmission as well as 408kW of power for the 2017 model. Fuel consumption is 8.8 l/100km highway and 11.7 l/100km of fuel-consumption, combined. It definitely is worth the hype and will make even the most sceptical start singing its praises. The BMW M4 GTS is all about challenging yourself to push the limits and do better than what you’ve done before. The M4 GTS is powered by the 3.0-litre twin-turbo straight-six engine with a power output of 368 kW. It’s lighter than its predecessors (M3 CSL and M3 GTS) and its top speed is a claimed 305km/h. The sleek elegant exterior and the top-class interior make it a favourite of many car enthusiasts. Whether you are looking for one of the fastest cars on the market or want to indulge in a sports car AutoTrader South Africa has the perfect car for you. Leading the media market space for buying and selling cars over the past 24 years, AutoTrader has over 60 000 vehicles to choose from, with their range growing daily. Get fast and furious with AutoTrader today.